Preheat oven according to crescents. Make hollandaise sauce. Set aside. In bowl, mix heavy creamer and eggs. In skillet sprayed with cooking spray, brown meat. Add in egg mix and velveeta. Cook. In cake pan, spread out crescents. Top with desired amount of hollandaise sauce. Top with eggs. Sprinkle shredded cheese. Sprinkle pepper and oregano on top. Bake accordingly, mine always goes about 5 minutes longer. *You can add whatever other toppings you like: Onions, jalapeno, etc. 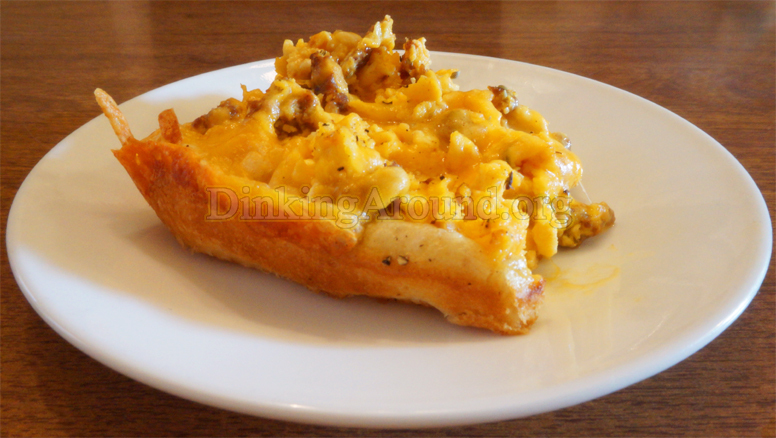 This entry was posted in Main Dish O' Food, Recipes and tagged breakfast, cheesy, egg, game day recipe, hollandaise, pizza. Bookmark the permalink.